Former Mazda factory World Rally Championship driver Ingvar Carlsson has died at the age of 62. The Swede is believed to have suffered a short illness before passing away last Thursday. 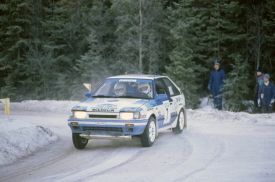 Carlsson was best known for a brace of WRC wins in 1989, when he collected victories on the Swedish Rally and Rally New Zealand in a Mazda 323. Bremax MD Max Mosam had the pleasure of working with Ingvar during this period. Bremax electronics sends its condolences to Carlssons family and friends.